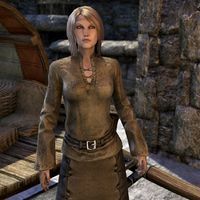 Aerana Frost-Tree is a Nord working at the Cold-Moon Fine Steeds in the city of Windhelm. "Hey there! I'm just preparing some oats for the horses. You need anything, you should talk to Afneer. He'll set you right."